Free medical, dental and vision care will be offered at a massive health clinic to be held by Remote Area Medical (RAM) April 1-4 at Cal Expo in Sacramento and April 9-12 at the Oakland Coliseum. Healthcare professionals from California are expected to provide care for an anticipated 1,000 people per day if the event is fully staffed. Northern California organizers have been recruiting medical, dental and vision care providers for several months and efforts are continuing. “We need this clinic to operate at full capacity so we won’t have to turn people away who need help,” states Pamela Congdon, RAM Northern California host coordinator. Congdon, who is working full time on a RAM clinic in Sacramento as well as Oakland, is pleased with the response so far, but says more volunteers, especially in vision care, are needed. “Healthcare providers who work at RAM events make a huge difference in peoples’ lives, and the care they give is often life-changing.” She encourages those interested in volunteering to register at www.ramcaliforniavolunteers.org. 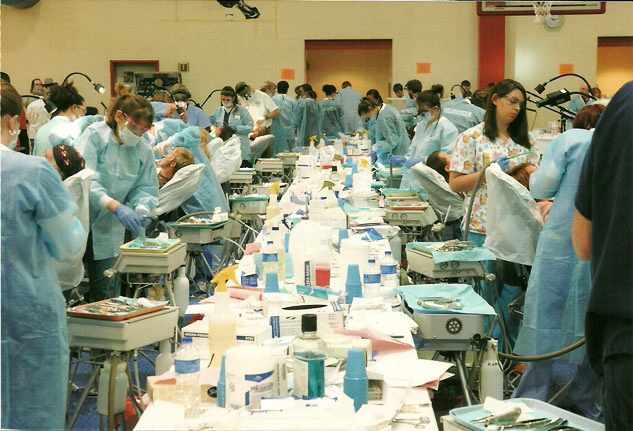 Wherever RAM clinics have been held, the need for its services has been evidenced by the large and often overwhelming crowds of people who attend. RAM clinics typically serve the uninsured, underinsured and impoverished. However, according to RAM founder Stan Brock, recent clinics have seen an increase in the newly jobless, the working poor, and insured families who are unable to pay high insurance co-pays and deductibles. The healthcare clinics will have at least 50 dental chairs, 30-40 medical exam rooms and 20 or more eye exam stations. Mobile vision labs will produce free prescription eyeglasses on site. Dentistry will include cleanings, fillings and extractions. Medical doctors will provide services ranging from consultation and diagnosis to minor medical procedures. Nurses will staff triage areas and provide medical assistance. Clinic participants will be seen on a first-come-first-serve basis, with no income test or eligibility requirement of any kind to receive treatment. Numbers will be distributed to patients at 3:30 a.m. and tretments will begin at 5:30 a.m. The clinic will run until approximately 6 p.m. each day. All services will be provided by California licensed volunteer healthcare practitioners. RAM is holding the Northern California clinics at the invitation of the California Association of Oral and Maxillofacial Surgeons (CALAOMS) and the assistance of the TZU Chi Foundation, which are involved in organizing and facilitating the events. Founded in 1985, RAM is a charitable relief organization based in Knoxville, Tennessee, that hosts clinics in medically underserved areas, both in the United States and other parts of the world. First known for its relief efforts in remote areas of third world countries, and later in rural Appalachia, RAM was profiled on “60 Minutes” in 2008. The program generated a tremendous response that facilitated an outreach into urban America, where the millions of uninsured and underinsured continue to grow. All RAM events are staffed entirely by volunteer medical – and non-medical – personnel; supplies and equipment are donated or provided by RAM. All services are not only cost free to clients, but are cost free to the taxpayer and government. RAM, a 501C-3 entity, is supported by contributions and fundraising efforts. More information about RAM may be found at http://www.ramusa.org. This three-minute video clip shows one of RAM’s large urban clinics in Los Angeles: MSNBC, August 2009, Free LA Health Clinic. This 13-minute segment from “60 Minutes” tells the inspiring RAM story: CBS, March 2008, Lifeline. yeah good perform by means of writers. their very helpful in my opinion. the teeth usually an essential prior of physique. thank you for expressing this blog.